href="http://marriedwiki.com/wiki/kelly-ripa">Kelly Ripa, who was at the receiving end of the GLAAD Media Award for Excellence in media has stolen the hearts of millions with her show performances. Even actor Mark Consuelos couldn't resist falling in love with the beautiful host. For her outstanding performance in Live with Kelly and Ryan, The couple is married after over a decade of relationship and is still going on together in their love life. Find out below, the secrets to their strong relationship and how they managed to keep going for all these years. Also, know about their children. Kelly Ripa is an American Actress, dancer, talk show host and a television producer. She is the co-host of the morning show Live with Kelly and Ryan who also appeared on the ABC sitcom, Hope & Faith, from 2003 to 2006 and 90's tv series All My Children. 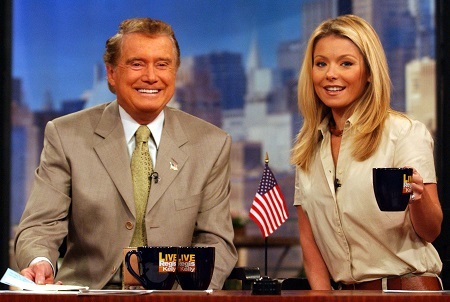 Kelly Ripa first met Mark in the 1990s. According to Ripa, their relationship is strong because of their strong communication, their boundaries, their gratitude and support to each other and of course their weekly date nights. They started dating since then and over the course of years has always been open to reveal their union stories. The couple tied the knots in May 1996 and are still humble to their relationship. The couple spends their weekly date nights either watching movies or watching Top Chef. She often posts pictures of their date nights enjoying their evening on Instagram. She shared a picture of her children and husband during their vacation to Mexico and we can see how their children have grown-up. Let's hope that the host of Live with Kelly and Ryan find even more happiness in her relationship in the days to come. Kelly started acting from her high school play The Ugly Duckling when she was approached by her current manager Cathy Parker. She also performed in several local theatres. In November 1990, she performed in the series All My Children where she met her husband Mark Consuelos. During 1980, she appeared in Dance Party USA, where she revealed her dream to become a newscaster. She also participated in the ABC First-Ever Super Soap Weekend at Disney/MGM Studios, Florida on October 19 and 20, 1996. She also hosted the second-most-watched daytime talk show on television Live With Kelly alongside Regis Philbin for over a decade and also with Ryan Seacrest and Michael Strahan. Moreover, she has also performed in movies including Cheaper by the Dozen(2003), The Stand-In (1999), 1996's Marvin's Room and voiced for different animated movies including 2008's Delgo and Fly Me to the Moon and 2003's Kim Possible: A Sitch in Time. She is the winner of the Daytime Emmy Award for Outstanding Talk Show Host 2012 and Daytime Emmy Awards for Outstanding Talk Show Host 2016 for Live with Kelly and Ryan. She also received the GLAAD Media Award for Excellence in media. The bubbly host's humorous performance and her ability to naturally perform in front of the camera has made her an audience favorite and she is well honored for it. She attended as well as graduated from Eastern Regional High School in Voorhees, New Jersey (1989). Her father, Joe Ripa, was sworn in as the County Freeholder for Camden County in the state of New Jersey in 2004. She is a huge fan of tv series The Apprentice (2004), Deadliest Catch (2005) and Wife Swap (2003). She regularly chooses to host the episodes of Live! with Kelly barefoot. She broke the Guinness World Record for Most Custard Pies Thrown in One Minute during segments on Live! with Kelly by throwing 22 pies at Wilmer Valderrama in September 2006. She is 3/4 Italian and 1/4 Irish. Her father is full Italian American and her mother is Italian and Irish American. According to CelebrityNetWorth, her net worth is estimated to be $100 million. She stands 1.59 m tall.